Fathers are important. Despite this, the past few decades have been rife with worries about workaholic fathers, absent fathers, distant fathers, all sorts of needs-improvement fathers! It must be a modern phenomenon, right? 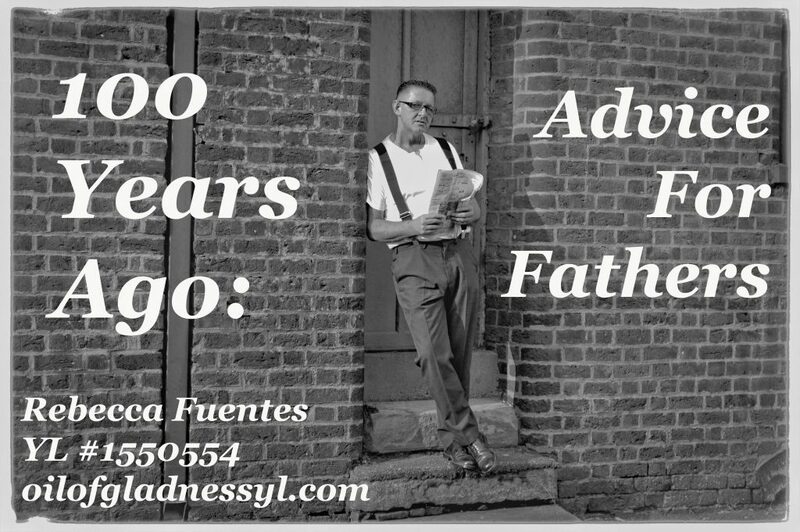 Surprisingly, a century ago, mothers and experts were already worried about fathers and their role in the family. A full one hundred years ago, William Byron Forbush lamented, “reputable men are fullfilling every responsibility in life except their principal one.” What was that principal responsibility? Parenting. He records how men working hard and long for their families rarely see, much less interact, with their children. 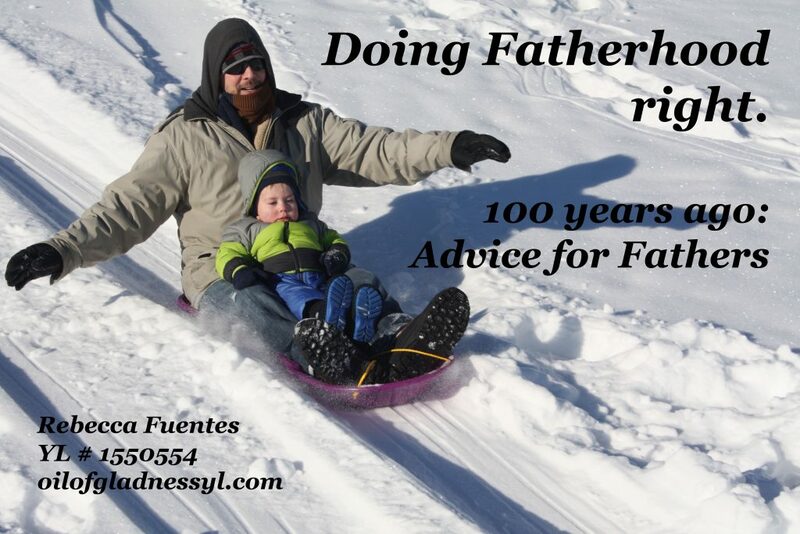 “A father,” he says, “is really an admirable person to be a parent.” Mr. Forbush wrote his advice for fathers in the 1915 edition of The Child Welfare Manual–-the best advice available 100 years ago. He outlines those things a child has a right to expect from a father. Children have a right to play with their fathers. Children cannot always share in adult tasks, so it is important for adults to share in children’s tasks–which are mainly play. Fathers must not live on a pedestal, high above and far away from their children. Instead, they must make it a priority to spend time–at least and hour a day–down with their little ones. The child should choose the activity for this time, not the father. It is time to enjoy each other’s company and for the father to get to know his children. Children have a right to learn from their fathers. Fathers often have hobbies and interests they enjoy. My father spent hours working on guns in his shop after work. He was a gunsmith out of interest, and some of my fondest memories growing up were going hunting and shooting with Dad. Though Mr. Forbush is writing in a time when men’s and women’s work were more sharply divided, the basic idea is still valid. If dad enjoys working on cars, he should share and teach this to his children. If his love is football, cooking, grooming the yard, camping, or any other wide variety of options, this should be taught to and shared with his children. Like play, working together on something creates a strong bond between fathers and their children. Children (boys especially) have a right to learn chivalry. “A father ought to teach his sons . . . an intelligent and chivalrous attitude toward womanhood.” Through the 100-years lens, this translates to teaching young people safe and moral attitudes toward sexuality. It’s a topic that has gotten much more complicated in the last century. Safe and moral mean many more things than they did then, but parents still need to pass their values on to their children. Not through fear, but through example and reason. Children have a right to fathers who know them and know about them. Perhaps Mr. Forbush’s biggest lament is fathers who expect perfection from their children, and drive them away in the requiring. Father’s must have realistic expectations of their children based on their age and what they have been taught. They must remember their own childhood scrapes and mistakes and extend grace and understanding to their children. Most of all, a father must get to know his children from a very young age. He urges fathers to enter the nursery. Fathers, he says, will be better for knowing and engaging their children. Ironically, and sadly, Mr. Forbush’s final warning echos a well known and much more modern song, “Cats in the Cradle,” by Harry Chapin. The father who sends his children away, to play, to school, to college, will find himself old, and his children grown. And they will be strangers to each other. Though details may differ, Mr. Forbush’s advice echoes across the decades. It is even found in the mouth of Pope Francis, “Waste time with your children.” Play with them. Teach them your interests and hobbies. Give them the skills they will need to be successful. Do not strict and unaffectionate, but empathize with them. Know them, so you will not be strangers together when they are grown.